It's funny how drinking the recommended eight glasses of water a day may sometimes seem impossible, but eight glasses of wine can be done in a meal! 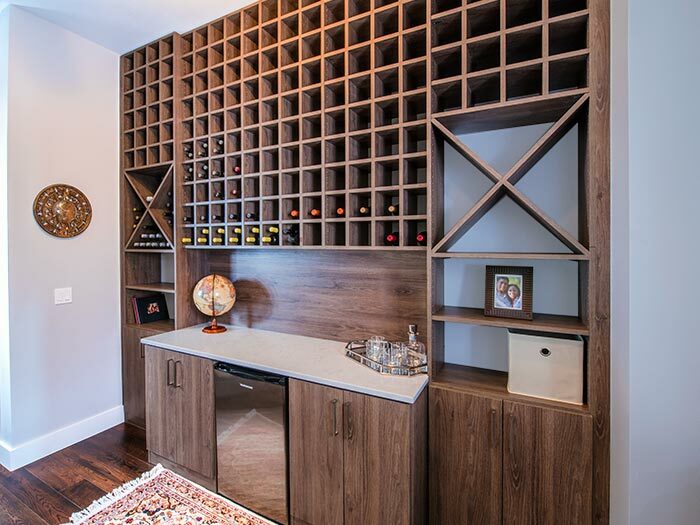 Designed to fit into an alcove in a hallway, this wine center includes 332 wine bottle storage capacity. One of the best wine storage solutions you will find: any wall can accommodate custom wine storage like this one. The custom cabinetry includes wine bottle storage that transforms the simple wall unit into an attractive focal point of the room. 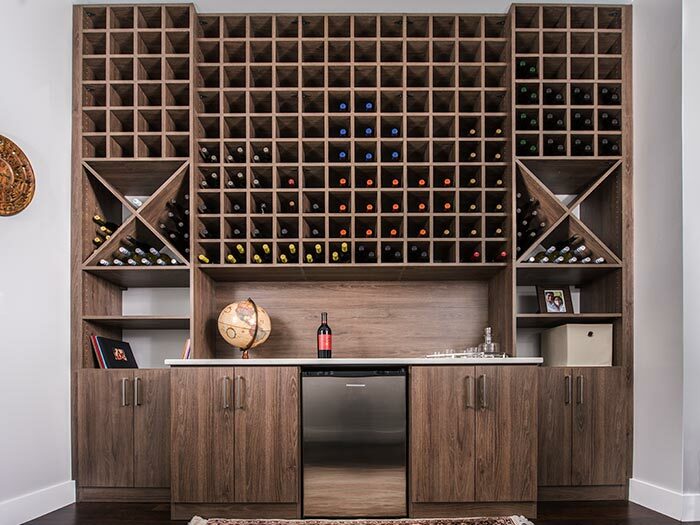 This custom wine and beverage center is sure to please any wine aficionado. Finding space to add new storage to a home can often be difficult — especially in a condominium or smaller dwelling. The owners of this condo desired a wine storage solution that could handle over 300 bottles, but there was no room anywhere in the kitchen or pantry. Creative thinking was needed in order to find other, potentially under utilized areas of the home large enough to satisfy the owner's needs. A long, narrow hallway between the bedrooms and utility closet was pressed into service for the new wine center. Designed to partially recess into an existing shallow alcove, this wine storage solution takes full advantage of all space from floor to ceiling without imposing on the hallway functionality. 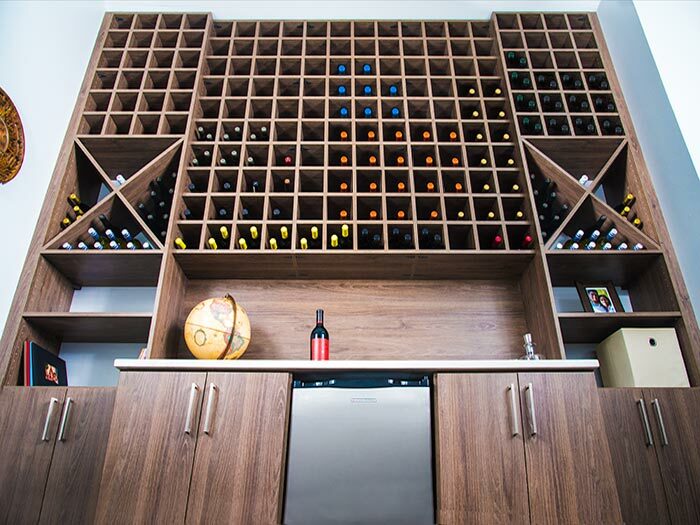 It includes wine bottle storage for up to 332 bottles, satisfying the owner's current needs with room to grow. The home's modern aesthetic, accented by traditional pieces like the rug and art pieces, is complimented by the Cocoa Bean finish used on this wall unit. 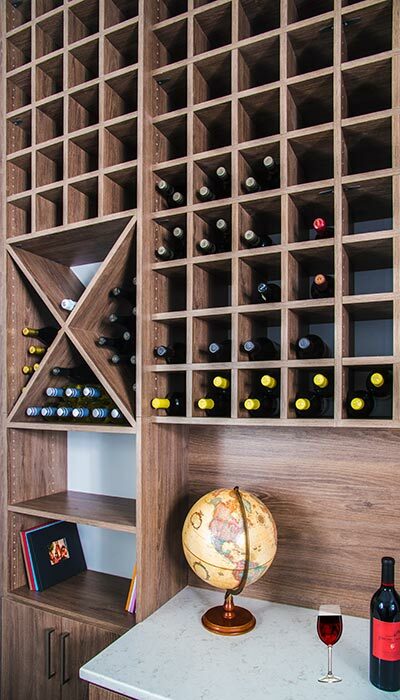 Wine bottle storage is handled through the use of x-shaped wine storage cubes which hold about 48 bottles each, and square cubbies holding up to two bottles a piece. They keep the bottles horizontal, ensuring the corks never dry out — a must have for serious wine connoisseurs. It's a modern storage solution for a "vintage" beverage. A cabinet covered with a quartz countertop serves as a staging and decanting area for entertaining or just a quiet evening at home. Space for an under counter refrigerator was included in the design, ensuring beverages will be chilled to the perfect temperature. Side cabinets are perfect for storing glassware and bar tools.